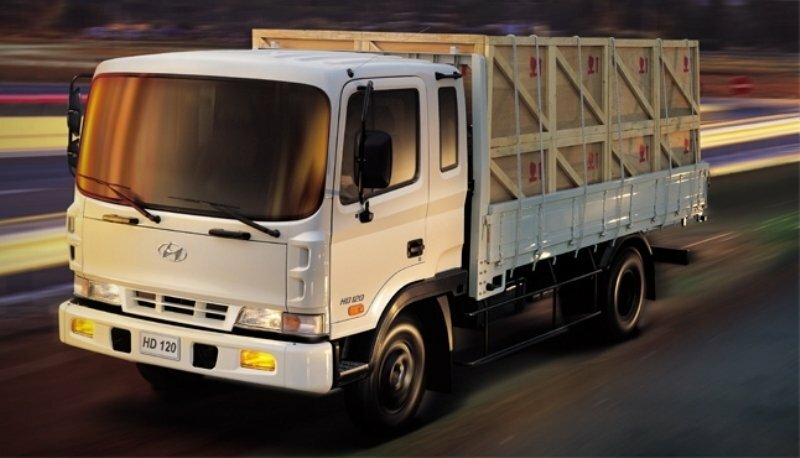 The Hyundai HD 120 is a lightweight commercial vehicle with a cab over engine configuration designed for medium duty activities. The truck features a standard full floating cab suspension for a more comfortable ride and has a roomy and spacious cabin designed with practicality in mind. 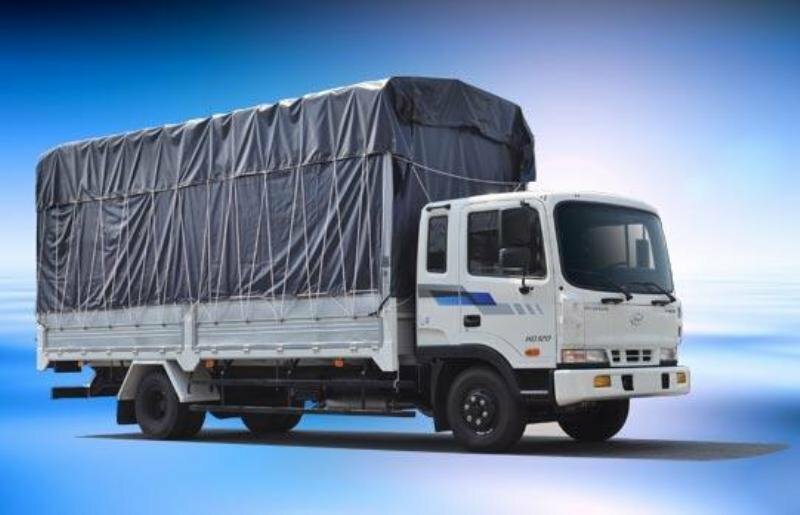 To be able to cope with a wide range of applications, the truck is offered with a choice of numerous wheelbase dimensions and different GVW (gross vehicle weights) ratings which range between 12,520 – 21320 kg. 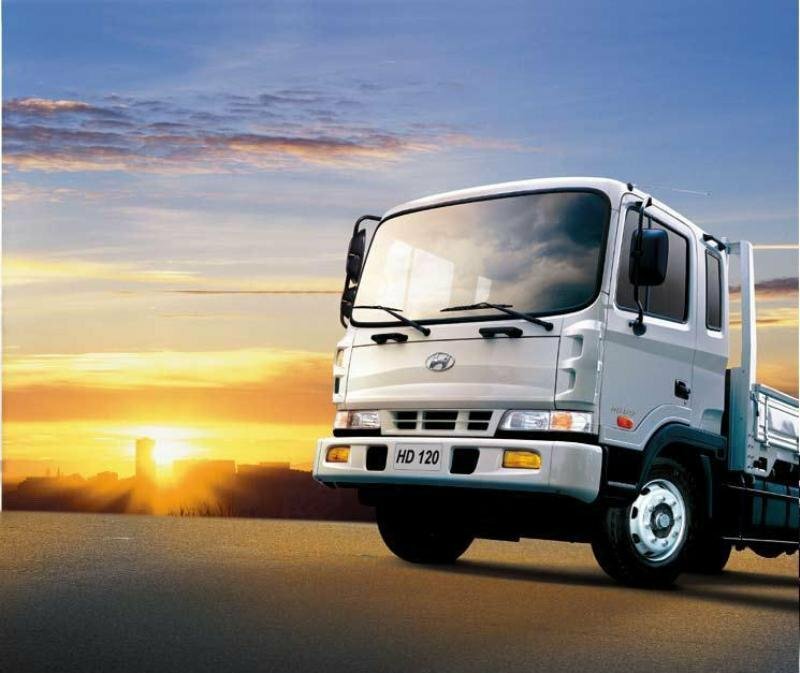 The Hyundai HD 120 truck is available with two engine options which develop 196 hp or 225 hp. 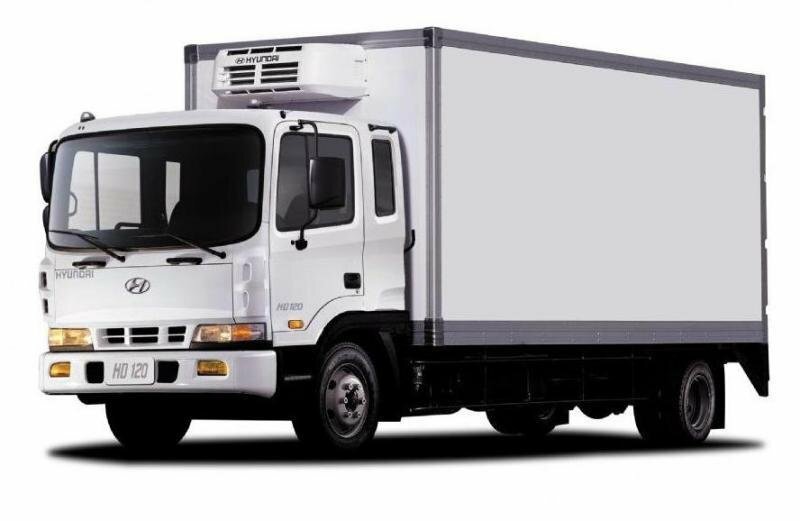 The Hyundai HD120 has a pretty basic design which compared to other trucks in the segment is a bit dated. However, given the utilitarian character of the vehicle the robust design is a pretty good match for its tough working conditions. The front end is dominated by a massive windshield with two side air deflectors mounted underneath it. There is also a small radiator grille which looks dated and won’t win you any beauty contests. The grille is flanked by two thin rectangular headlights which come with integrated turn indicators and underline the utilitarian character of the truck. The bumper is painted in the same color as the body and continues the same boring design language as the rest of the vehicle, being fitted with two simple rectangular fog lamps and other two small air intakes. 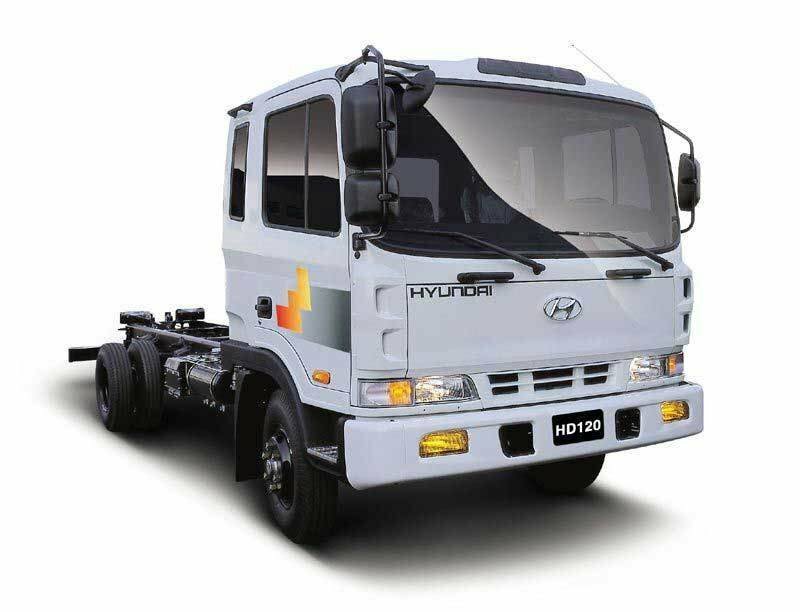 The Hyundai HD120 is available with four different wheelbases which include Short Wheelbase, Long Wheelbase, Extra Long Wheelbase and Ultra Long Wheelbase versions. 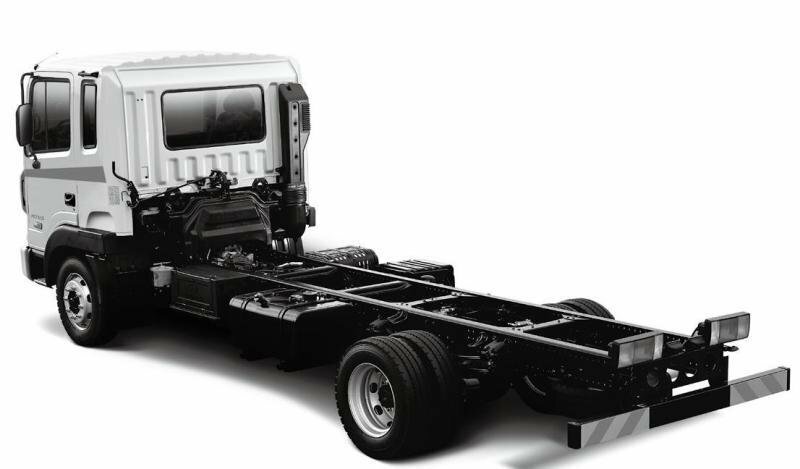 To achieve a higher rigidity and strength, Hyundai added heavy duty cross members which effectively distribute payload stress over the frame employed by an all-bolted construction technique. For easy access inside, the truck is fitted with two convenient aluminum safety steps and well positioned grab handles. The cabin offers plenty of space and thanks to the generous glass area it also has a nice airy feel. The interior design however is starting to show its age and Hyundai should do a significant upgrade if it wants to keep up with today’s requirements. The materials are also poor compared to other trucks in the segments and the fit and finish could’ve been better as well. The dated style can also be seen in the instrument cluster’s design which looks like it come up from a 20 years old truck. Despite its ancient look however, is fairly easy to read and won’t act as a distraction from the road. Luckily all the controls have an intuitive layout and you won’t find yourself searching disoriented thru a chaotic sea of buttons and switches. The seats aren’t that bad either and feel pretty comfortable even for a long run. They are also offered with a wide range of adjustments, so they can fit any shape and size without too many efforts. Beside the driver there is room for another two people which have plenty of leg-, head- and shoulder-room. As it was expected, the all-round visibility is part of the high class as the huge windshield, the massive mirrors and the big door windows would serve you pretty well in any situation. 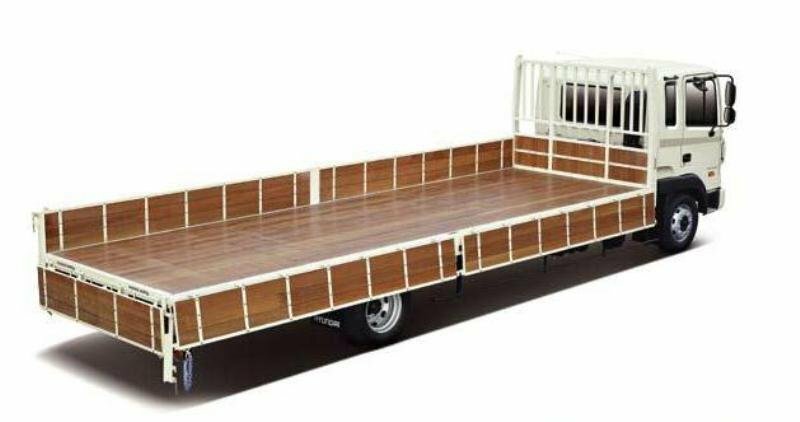 As most trucks in the segment storage space is not a problem. Besides the typical door pockets and the generous glove box you also get overhead consoles and an extra storage space which is revealed when the middle seatback is folded. We also like the keyhole lamp, the air conditioning system and the folding gearshift lever which add a dose of common sense comfort to an otherwise rudimentary interior. The Hyundai HD120 is powered by a D6DA engine which is offered with a choice of two outputs of either 196 hp or 225 hp with 570 Nm and 640 Nm of torque, respectively. The engines are mated on six speed manual gearboxes, with 6 reverse one forward configuration. Whether you choose the entry level inline naturally aspirated six cylinder diesels or top-of-the-range turbo charged intercooler unit, each engine offers adequate performances with top speeds that can go up to 132 km/h. The engines never feel underpowered and thanks to their generous torques they can deal with huge payloads without breaking a sweat. For a better reliability and easy maintenance the engines are combined with an auxiliary starter, oil cleaner and a maintenance lamp. For easy servicing and regular checks the truck’s cabin can tilt forward to a 45 degree angle providing quick and easy access to the engine compartment. The truck is built on a durable frame which serves as a strong base for its tough missions. 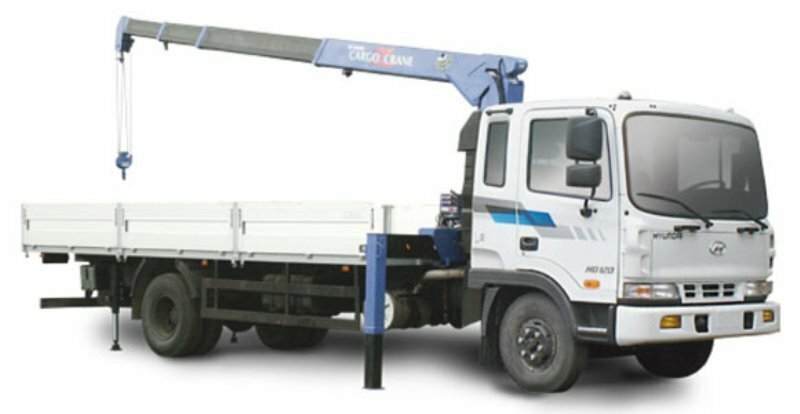 The Hyundai HD120 if fitted with an all steel suspension combined with an isolated cab which rides on four coil-type mounts to isolate the driver from road shocks and vibrations. For increased comfort, there is also available a full air suspension as an optional feature. The standard power assisted steering is light and offers a small road feedback, but it will serve you well at low speeds and needs only minor adjustments to keep the truck on a straight line at higher speeds. The stopping power is assured by a full air braking system combined with a capable exhaust brake. Unfortunately Hyundai offers ABS and Anti-Slip Regulator only as an optional feature. Hyundai’s HD120 medium duty truck looks like a dinosaur when compared to its rivals. The exterior style is the first sign that shows its age, while the cabin is a complete disappointment in terms of design and technology. Apart from the poor materials, the fittings aren’t great either and everything looks light years behind other vehicles in the business. The good part is that the overall ergonomy is not affected, the controls are placed within easy reach and the seats are pretty comfortable as well. The engines aren’t the strongest units in the segment, but they can deal pretty well with the workhorse nature of the truck and won’t disappoint you in any situation. The ride is also pretty good and the handling is at par with its competitors. The best parts of the truck are its price, reliability and the relatively small costs of ownership.